The "Ciencia al Servicio de Puerto Rico" project brings together professionals in the areas of science, technology, engineering and mathematics (STEM) with 6th-8th grade educators to create science lessons relevant to the Puerto Rican context and that reflect the process of science, with the purpose of empowering students to solve problems they observe in their communities. The project, supported by the Banco Popular and Intellectus Foundations, and which has the collaboration of the Puerto Rico Department of Education, consists of three stages: a training stage that includes the development of lessons, their implementation in schools, and a community outreach stage. The first stage began with a two-day workshop, July 31 and August 1, 2018. During the first day, teachers and scientists were trained in project-based learning (PBL), contextualized education, and science communication strategies. During the second day, teachers and scientists collaborated to create together a dozen lessons on topics such as mosquito control, climate change, space exploration and more. The lessons will be implemented by the teachers during the 2018-19 academic year and it is expected that 2,500 students from all over Puerto Rico will be impacted. The lessons will also be made available for free on the CienciaPR.org website. After the workshop, the participating scientists will schedule visits to each of the participating schools, to offer talks and serve as role models, while testing their communication skills. The project not only seeks to change how science is taught in the classroom, but also to highlight the impact that science education has on the lives of students, their communities and the development of Puerto Rico. To do this, students will integrate scenarios, populations, or resources from their communities to their projects and will carry out outreach activities in which they will present the results of their work. "Through “Ciencia al Servicio”, we are laying the foundation to transform scientific education in Puerto Rico in a way that stimulates critical thinking, entrepreneurship, and problem solving," said Dr. Giovanna Guerrero-Medina, Executive Director for CienciaPR. "By involving teachers, communities and experts we seek to create a sustainable and replicable model, since all parties come to the table with a common goal: to have a positive impact on their community and Puerto Rico," added Dr. Greetchen Díaz Muñoz, Director of Education Programs and Community Partnerships for the organization. 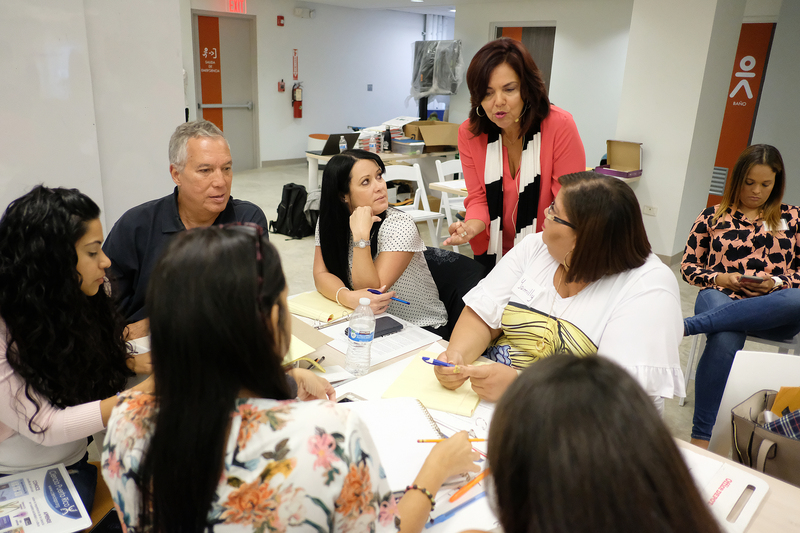 The workshop has the participation of 53 teachers from 47 schools located in 16 municipalities (Adjuntas, Bayamón, Caguas, Carolina, Cataño, Ciales, Fajardo, Guaynabo, Naranjito, Ponce, Rio Grande, San Juan, Toa Alta, Toa Baja, Trujillo Alto, and Vega Alta). The 18 participating scientists represented several universities including the Arecibo, Mayagüez, Medical Sciences, Río Piedras, and Bayamón campuses of the University of Puerto Rico, the Metropolitan University, the Pontifical Catholic University of Puerto Rico, the Universidad Central del Caribe, and the University of California, Davis, as well as the Puerto Rico Astronomy Society, and the Puerto Rico Vector Control Unit. "I wanted to put my skills and knowledge at the service of teachers and students in Puerto Rico, to help transform scientific education," said Dr. Samuel Díaz Muñoz, assistant professor in microbiology at the University of California, Davis. “As a scientist I am passionate about education and in this workshop I realized that as educators our role is to guide students to reach their own conclusions and apply what they learn in their daily lives. People learn science more effectively when it is contextualized, when we connect it with our audience,” added Flavia Tejeda, a PhD students in neuroscience at Universidad Central del Caribe. "In this workshop, I clarified many doubts I had about the importance and implementation of PBL, I learned how I can be a better communicator in the classroom, and how I can use these kinds of lessons to give my students a different perspective of science, so that they can be active participants," concluded Mrs. Yolyveth Cortada, science teacher at Escuela S.U. Alfredo Aguayo at the Playa de Ponce.